Redesigned for the 2019-20 season, FC Boulder is excited to share a player pathway that serves every player in our club well, regardless of previous experience and ability level. As players grow in the program, so also grow the number of options available to them — experiences that vary in terms of competitiveness, time commitment, and cost. We want to ensure that every player joins a solid team, with a well qualified coach, at a level that provides equal measures of success and challenge — the true catalysts for development over time. 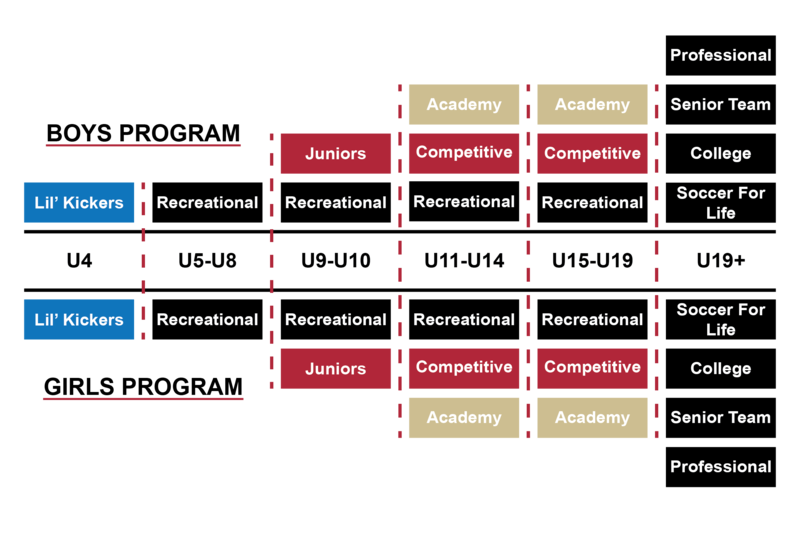 The chart below outlines the player pathway at FC Boulder. Select the age group that fits your athlete and view the soccer options that are available. Our FC Boulder Academy program — the most competitive environment offered in our region, including the US Soccer Development Academy which serves the top 13U and 14U players in the north Metro area. Our FCB Competitive Program which is designed to give an engaging and challenging experience to all players seeking competitive play. The Recreational level provides joy in the game without the same financial and time commitment required in the other programs. Lil’ Kickers is our youngest program and is designed to introduce players to the game and get them excited to begin their soccer journey. FC Boulder also offers college prep, senior team opportunities, and an opportunity to make soccer a part of the rest of your life! There is a place for you at FC Boulder, and we look forward to facilitating your soccer experience from beginning to end of your youth career.